I coded this map with trepidation since comparing unemployment rates across provinces isn’t always as important as considering one province’s current rate against its own historic numbers. For example, this map shows us that Ontario’s unemployment rate still lags behind Alberta’s. No surprise there. What the map cannot do, though, is show that Ontario’s unemployment rate for this month – 6.5% – has finally recovered since the Sept 2008 crash. The last time Ontario’s unemployment rate was this low was in October 2008. To best visualize the province’s unemployment trend back to pre-recession numbers, one should simply chart the data, or even just give the real numbers in tabular format. The best way to do this on the web is with charts.js, which seems to be some of the easiest coding I’ve ever seen. That will be my project for later this week. Data from StatCan CANSIM Table 282-0087. This week, I’ve taken the same population density variable I used last week and plotted it for Brantford, Ontario. I’ll be speaking about open StatCan data to our journalism students in Brantford in a few days’ time, so it was only fair to plot the same variable for our students in this city, too. Data from the 2011 Census of Canada, at the census tract level. This week, in the middle of Open Access Week, the Canadian Library Association issued a statement criticizing the government cuts that have been made to Statistics Canada in recent years. This critique is strongly worded and it packs a punch; I expect it to gain traction beyond our regular librarian circles. But getting the word out cannot happen without your help. Read the statement and share it with your colleagues and friends, especially with people outside of your typical library and archives networks. To make the case that StatCan is not just a numbers factory but a social barometer for the nation, we must extend our voice. We must be on point, and we must persuade. I have copied the text of the statement from the original PDF in order to help circulate this statement. When you share, please link to the original document or to www.cla.ca. The Canadian Library Association / Association canadienne des bibliothèques (CLA/ACB) is the national voice for Canada’s library communities. Canadians know that access to reliable and high quality information, from the widest variety of points of view, is critical to a prosperous, functioning and democratic society. The decisions that citizens, communities, and governments make are better informed and have the ability to be more innovative when there is a free exchange of ideas facilitated by open and equal access to information. It is with these values in mind that CLA responds to recent and ongoing changes at Statistics Canada. Recent programme cuts and policy changes at Statistics Canada have made it more difficult than ever for Canadians to track changes to critical issues that affect their communities, such as unemployment rates or the education of our children. The replacement of the mandatory long-form census with the National Household Survey, at a significantly greater cost, and the cancellation of many social surveys has made it increasingly challenging, if not impossible, for municipalities, hospitals, schools, and government agencies to administer social programmes and to track their success. In some cases, municipalities are financing their own surveys to gather the critical data they once had access to through StatCan. StatCan cuts and changes are continuing to impede effective planning for all agencies, making future programming a costly gamble. Additionally, with all levels of government focused on social and economic innovation, it is imperative that municipalities have the ability to look back on trends in order to plan for the future with reliable data. Budget cuts have affected Statistics Canada enormously, which in turn affects all Canadians and all levels of government. While StatCan extended a lifeline to surveys and tools that tracked the nation’s economy through these cuts, it did so at the great expense of its social surveys, where significant budget reductions to the agency and ill-advised policy changes to its census program created major gaps that cannot be filled. The Workplace and Employment Survey, which examined employer and employee issues affecting the Canadian work place, such as competitiveness, technology, training, and job stability. Canadians and their communities are now suffering the consequences of budget cuts and policy changes at Statistics Canada. Major, long-standing surveys that paint a dynamic picture of Canadian society have been eliminated, making it nearly impossible to do year-over-year comparisons and to track the changes in social data and programs over time. It is hard to imagine less responsible measures in the age of open data, open government, and evidence-based policy-making than limiting the supply of data or replacing it with inferior products. In the context of fiscal responsibility, CLA believes that the government can be much more effective at planning and supporting sound planning. The current government is determined to balance the books and bring Canada into an environment of economic prosperity and growth. In order to plan for these outcomes, careful public spending is dependent on correct information to inform decisions. Statistics Canada has long been the core agency for Canada’s ability to plan and spend carefully at all levels of government, and within the business and not-for-profit sectors. CLA believes that without consistent and reliable data, this ability will be lost. The CLA urges the government to return Statistics Canada to its status as one of the world’s most respected National Statistical agencies by restoring its funding and the long-form census. The CLA urges the government to provide Statistics Canada with the support it needs to collect, analyze, and publish data that has proven, longstanding value for decision-makers, communities, and Canadians alike. The Canadian Library Association/Association canadienne des bibliothèques (CLA/ACB) is the national voice for Canada’s library communities, representing the interests of libraries, library workers, and all those concerned about enhancing the quality of life of Canadians through information and literacy. CLA/ACB represents 1410 library workers, libraries and library supporters; and Canadian libraries serve in excess of 34 million Canadians through the nation’s public, school, academic, government and special libraries. One of the things I’m constantly doing as a government documents librarian is giving lessons on Statistics Canada geographic areas. Census geographies can be downright confusing to the new user (and to sometimes to the seasoned expert!). The names are riddled with acronyms and jargon, and their relationships to other areas and spaces can be complicated. One legally incorporated township may be considered a census subdivision while another may be classified as only a census agglomeration. 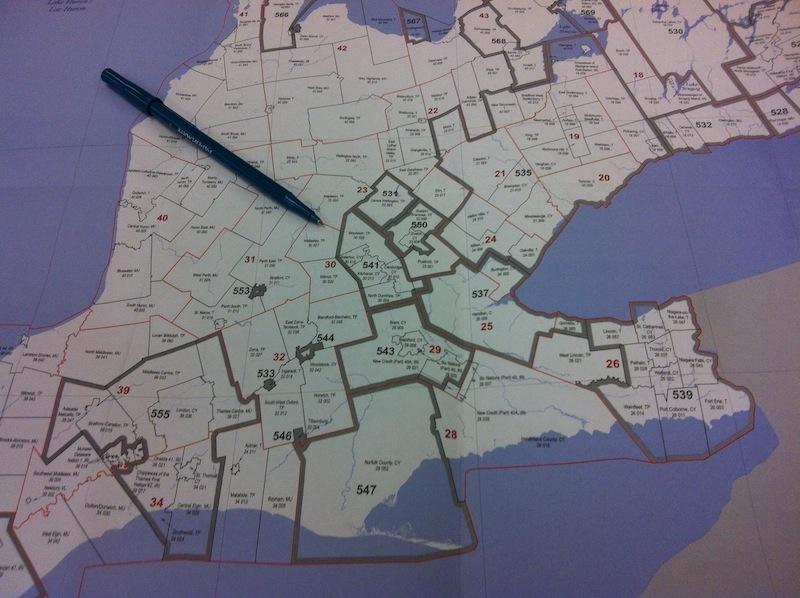 Another city may be classified as a census subdivision, and also be part of a census metropolitan area of a similar name, e.g., Toronto CSD and Toronto CMA. Or, a city may be classified as a census subdivision and exist not only in a CMA with a similar name, but also a census division (I’m looking at you, City of Waterloo CSD, Waterloo Region CD, and Kitchener-Cambridge-Waterloo CMA). And if you dare introduce census tracts the first time through, your short introduction to the “Russian dolls” nature of census geographies runs the risk of turning your lesson into an information dump about privacy and data validity when all that your first-year economics student wanted to know was why it’s so hard to get comparable income and migration numbers for Kitchener, Ontario, and The Pas in northern Manitoba. Don’t ask me how many census tracts this CMA holds. Confusion abounds. One of the problems we encounter are the tools we use to explain these geographies, which should be easily understood but are often abstract – we may live in towns and cities, but we refer to them as census agglomerations or CMAs. What can you use to show how spaces relate to one another, or how certain concepts can be measured and expressed spatially? The answer is a map, of course. God lov’em, those maps. Maps help us express numbers – quantities, amounts, rations, proportions – with colours and shapes, and in the regions we live in and travel through each day. Face it, “big data” wouldn’t be as big as it is today if we didn’t have “big maps” to help use make sense of the numbers. 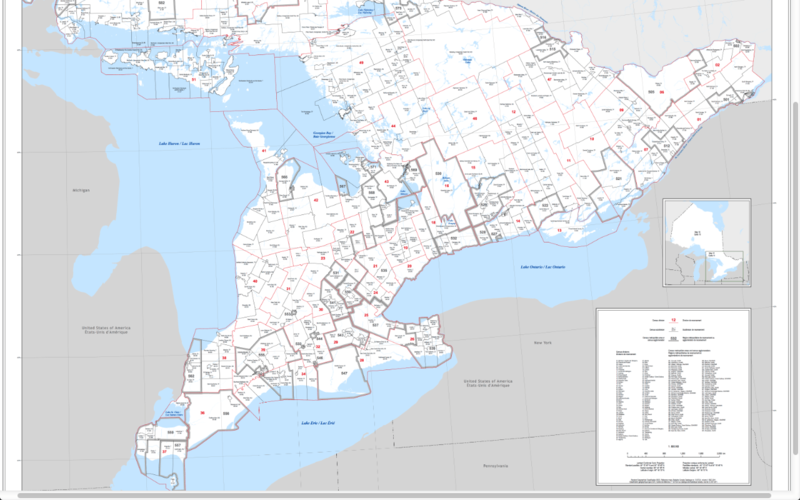 However, StatCan’s digitized maps are large, layered PDFs that aren’t always user-friendly. The Standard Geographical Classification (SGC) PDFs are great reference items, but they aren’t very accessible. And this creates a learning gap for so many of our users. To overcome this gap, I’m constantly pulling out the old SGC print maps, and I’m also cutting and pasting and hacking together magnified screenshots of the PDFs into my slide deck. 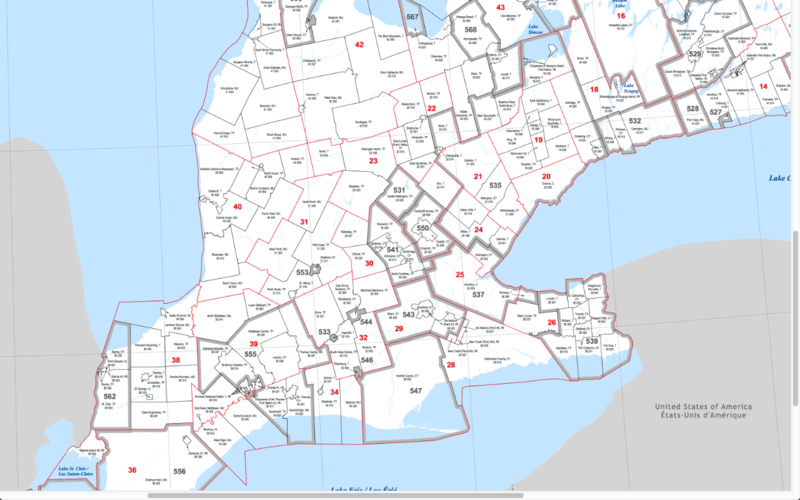 Typically, if you need census help and you’ve found me in person, then there stands a good chance that I’m going to crack open the SGC and unfold a map somewhere in the office (I even keep the southern Ontario CD-CSD map posted to a wall). I started doing this last Spring after I moved to Waterloo and had to learn the region’s geography and confirm its census divisions, subdivisions, and CMAs for myself, and I realized this was a simple and effective tool that should be used more often, especially with new StatCan users. Typically, I bring students to a nearby conference room and unfold the map on a large table. I find that being able to “walk around” the entire map and point to the places where the lines that signify the different geographies merge, separate, and then merge again, helps students understand some of the logic behind the regions (at least in terms of distance and population). They may not always be able to recall all the differences between a census division, subdivision and metropolitan area after a session, but they at least remember that there are differences, and these differences are important enough to affect their research. The classroom is a different story, though. When working with only one person or a small group, there is a persuasive element at work that captures everyone’s attention. Carefully unfolding and presenting a map to a small group of people is like opening a box that holds a surprise. (Let’s call this surprise “knowledge” and we’ll call ourselves awesome for charming our audience so handily into learning something). But if we take that same map into the classroom or lecture hall, it risks becoming an awkward, cumbersome prop. It can become a distraction or even a failed means to demonstrate your expertise in such a short time to such a large group of people. Maps that unfold to become wider and taller than you put the room’s attention onto your map-wrangling skills (however good or poor they might be) instead of on the knowledge you have share, so I avoid them. You’ve never caught me walking to a classroom with a print map, and I doubt many other librarians do that today. Instead, I give the class what they want and what they expect, and that means I work that map into my PowerPoint deck. Any time I’m introducing StatCan resources and geographies to a class, I insert three images of the same PDF map, each one magnified more than the last. This helps people “zoom in” with their eyes and see the many relationships and regions that are defined in one place alone. The length of time I spend on these slides depends on the classroom’s needs: sometimes, I spend only a few moments on these slides, and other times, I’ll spend five or ten minutes. What matters is that after I’ve finished up and am headed back to the office, I know that the instructor can pass around a slide deck that always refers to all these different areas. I know I’m not presenting anything new in this post: maps have long been a tremendous tool within government documents librarianship. Perhaps the takeaway lies more in information literacy than it does anywhere else. Is your digital resource, as presented to you, the best way to help the user understand the resource? You may want to turn to the print resource or manipulate the digital resource, as I do with StatCan maps, to improve learning and synthesis. It’s just one more tool (or two, in this case) in our IL toolbox. A few years ago, I designed a few rudimentary Google maps of Halifax from StatCan data. This was before I really knew anything about stats and data (n.b. I still don’t think I know much more than “some things” about stats and data), licenses, and how to properly interpret them. One map that I created showed Halifax’s population change, tract by tract, from 2001 to 2006. I’m giving myself embarrassment cringes by linking to it, but all the same: view it here. StatCan has produced PDF images that show tract-by-tract population changes from 2006 to 2011 for all census metropolitan areas (CMAs), including Halifax. 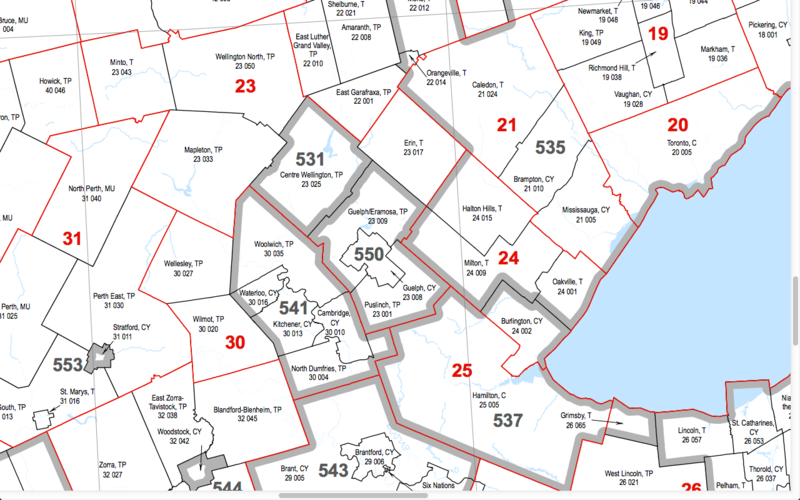 Click here to see Halifax’s population change table per tract. Of note: the suburbs clearly rule the roost when it comes to Halifax’s population changes from 2006 to 2011. The only tract on the peninsula showing a significant increase (i.e., over 11.9%) is Tract 2050019.00, in the middle of the peninsula. The increase in this tract is due, I’m certain, to the Gladstone redevelopment, the first major phases of which were completed – if memory serves me correct – in 2007 or 2008. This has not been a good spring for Canadian librarians and archivists, especially those who work at federal libraries and archives, which are being de-funded and dismantled by federal budget cuts. These information centres sustain government and public research capacity. Their ability to create, preserve, and provide access to public information in our country is at risk. April 13, 2012 – Publishing and Depository Services (i.e., Publications Canada, DSP) announces that beginning in 2014, it will no longer publish government information in print format, which ostensibly “aligns with the Government of Canada’s greening government initiatives” [PDF] but in practice jeopardizes access to government information in public and academic libraries from coast to coast. April 13, 2012 – Statistics Canada announces that it will formally close E-STAT in 2013 [PDF]. This is acceptable in most quarters since CANSIM statistics are now free for public use on StatCan’s website, but many librarians are appropriately wondering what the decline of this relatively easy-to-use socio-economic database and its simplified outputting functions for charts and tables means for teachers, students, and first-time users of statistics. April 30, 2012 – Funding is withdrawn from the National Archival Development Program (NADP) [PDF] and the Canadian Council of Archives is shuttered. Click here for immediate reaction to this event. April 30th, 2012 – Library and Archives Canada (LAC) gives notices to nearly half of its workforce of 544 librarians; nearly 20% are expected to lose their positions outright. The professional community later learns that the InterLibrary Loan programme at LAC will close on February 13, 2013, severely hampering the transfer of documents and research knowledge to and from Ottawa. May 2, 2012 (as reported) – Librarians and library services at federal departments, including Citizenship and Immigration, Agriculture, Environment, Industry, Transport Canada, National Defence, Public Works and Government Services, the National Capital Commission, and the Public Service Commission are given notice. This action jeopardizes the departments’ research capacity and their ability to access their own reports and products. I’m missing some announcements since I was away when so many of these cuts were announced, but this list nonetheless clarifies the seriousness of the situation. In the space of a few weeks, the federal government has severely hampered the nation’s ability to gather, document, use, and disseminate government and cultural information. You can learn what many of these cuts mean in clear, practical terms by reading this post written by my archivist friend, Creighton Barrett, at Dalhousie University’s Archives and Special Collections. Creighton explains how these cuts negatively affect the university’s ability to collect and maintain the records used by scholars and citizens in one community alone, and rightly notes that they are a “devastating” blow to information access in Canada. Now, consider how Creighton’s list grows when you add to it the ways in which these same cuts affect the libraries and archives in your own community, and then all other libraries and archives in Canada. And we haven’t even touched what these broader cuts mean for LAC’s programming and resources, StatCan programming, and the research capacity of federal departments and agencies. “Devastating,” may well be an understatement in the long run. These budget cuts are a knock-out punch to how public information is accessed and used across the country. The cuts not only affect the library community and possibly your civil-service-friend who lives down the road. They will affect the manner in which our society is able to find and use public information. If public data is no longer collected (see StatCan), preserved (see LAC, NADP, CCA), disseminated and used (see PDS/DSP and cuts at departmental libraries), then does the information even exist in the first place? There will be less government and public information, fewer means to access this information, and fewer opportunities to do so. Take a moment and recall the freedom you have been afforded to speak freely in this nation. The utility of that freedom is dependent on your ability to access the information you use to learn, to criticize, to praise, or to condemn. If knowledge is power, then a public whose national information centres and access points are ill-funded is a weakling. Libraries and archives provide Canadians with direct access to key government information, and for that very reason, they should be funded to the hilt. This is where I get to my point: We are now facing a situation in Canada where government information has suddenly become far more difficult to collect, to access, and to use. The funding cuts that Canada’s libraries and archives face is an affront to the proper functioning of a contemporary democratic society. These cuts will impede the country’s ability to access public and government information, which will make it difficult for Canadians to criticize government practices, past and present. I mentioned on Twitter that these cuts show us that the work of librarians and archivists are crucial to the nation’s interest. We are not mere record keepers, and neither do we spend our days merely dusting cobwebs off of old books. We are the people who maintain collections of public information, and we are the people who provide and nurture access to information. Many of us see ourselves as guardians of the public’s right to access information. If we take on that guardianship, then we must defend and protect these collections and access points. I’m not talking about a Monday-to-Friday, 9-to-5 job. I’m talking about advocacy, which doesn’t have an on/off switch. Either you do it or you don’t. So, what should you do? Get informed, speak up, and act. Write letters to the editor. Write to your professional associations and other like-minded organizations; lend them your support, and when needed, tell them to add force to their own statements. Write to your MPs, to other MPs (especially to MPs who sit on government benches), to cabinet members, and to the PMO. When you’re socializing with friends who aren’t librarians and archivists, mention how our work affects their work and their personal lives. Massive cuts to the nation’s libraries and archives do not serve the public good. These cuts may help balance the financial books, but they create an information deficit that inhibits research, stymies dialogue and criticism, and makes government more distant from the people.